Carolyn O’Bagy Davis, Hopi Summer: Letters from Ethel to Maud. Tucson: Rio Nuevo Publishers, 2007. 160pp. paper, $15.95. In January 1927, Carey E. Melville, a mathematics professor at Clark University in Worchester, Massachusetts, his wife Maud and their three children, left the comforts of their suburban home for a nine month adventure across the United States. Traveling in a newly purchased Model T Ford, the Melvilles drove south to Florida and then made their journey out West. In the summer of 1927, the Melvilles arrived at the Hopi villages of Sichomovi, Walpi, and Polacca in northeastern Arizona. At Polacca, Maud Melville met several Hopi artists, including a Hopi-Tewa pottery maker named Ethel Salyah Muchvo, her husband, Wilfred, and their children Minerva and Clifford. Unlike other tourist who had visited the Hopi villages in the past, Maud remained in contact with Ethel and her family after the Melvilles returned to their home in New England. 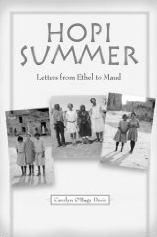 In Hopi Summer, historian and biographer Carolyn O’Bagy Davis uses Maud’s journal entries, Ethel’s letters to Maud, letters written by Christian missionaries, and Hopi oral interviews to tell the story of Ethel’s friendship with Maud. However, Hopi Summer is more than a story about a friendship between two very different people. It is a story about survival, death, life, and a Hopi woman’s determination to care for her family and ill husband. In the late 1920s and 1930s, diseases killed many Hopis on the reservation. Ethel’s husband, Wilfred, suffered from tuberculosis and his illness had a devastating effect on their children. Having experienced the pain and sorrow of losing eleven children to the disease, Ethel reached out to her pahaana (“white person”) friend, Maud, for comfort and compassion, while Maud responded with charitable acts and words of kindness. On several occasions Ethel wrote and asked Maud if she would send her extra clothes, winter coats, and blankets. In return Ethel sent Maud her pottery, Wilfred’s katsina dolls, and other pieces of Hopi craftmanship as gifts. After the Melvilles returned home Maud gave several lectures about the Hopis, and sold Wilfred’s art to people she had met at various speaking events. Maud sent the earnings from the sales to Ethel and Wilfred and the family used the money to purchase food and needed supplies. Ethel’s friendship with Maud had a business element to it that reflected Ethel’s commitment to provide for her family. Although other women have written about the Hopi people during this period, including the Christian missionary Abigail E. Johnson and the Christian biographer, Florence Crannell Means, Davis masterfully highlights the Hopi “voice” and provides the reader with a deep sense of Hopi ways and customs. Davis’s’ ability to write about the Hopi people, while at the same time not lead the reader into the “kiva” (metaphorically speaking), stands as a testimony to her sensitivity to certain aspects of Hopi religious culture. Davis’s research methodology is highly commendable, and serves as an example for individuals who desire to conduct research with an indigenous community. In this regard, Davis follows in the footsteps of Hopi scholars Sheilah E. Nicholas, Angela A. Gonzales, Patricia Sekaquaptewa, Lomayumtewa C. Ishii, and anthropologists Peter M. Whiteley and Wesley Bernardini. Each of these individuals have conducted extensive research on the Hopi Reservation and did so with the involvement and cooperation of the Hopi Tribe. Furthermore, Hopi Summer supports the understanding that Hopi intellectual property belongs with the Hopi people. In addition to sharing letters and pictures with Ethel’s family, including Ethel’s daughter, Vivian, Davis provided the Hopi Cultural Preservation Office with copies of her research and sought the assistance of Hopi scholars Hartman Lomawaima, former director of the Arizona State Museum, and Emory Sekaquaptewa.